From Kevin Williams comes this look at trends in the game console industry and certain issues they are facing there and a resurgence in interest in arcades thanks to Street Fighter IV. It also discusses the issues that mainstream gaming media happen to have when it comes to covering amusement. Enjoy! Battle Lines – Arcade Street Fighter IV Rocks GDC!Consumer game media and publishers have been thrown into consternation by the ground swell of popularity and enthusiasm shown by players and developers into the Capcom USA presented ‘Street Fighter IV’ arcade title. Following the swamping of the AOU show a few weeks ago, there was a raised speculation that a launch of an amusement title could actually influence Japanese game sale expectations. But it was the appearance of SFIV at the Game Developers Conference (GDC) last week in America that has seen major concerns voiced in the console sector. It has to be placed into perspective that the modern consumer games industry has plotted in detail their release calendar of major licenses, hoping to generate the biggest interest and also ensure the greatest revenue returns each year. Consumer publishers expecting to face a hard 2008 with strong competition from the movie industry eroding revenue as the public disposable income is split between going to see an avalanche of new mega-releases (new films from James Bond, Indiana Jones, Pixar, etc), competing against mega-releases on the console (new games from Grand Theft, Gran Turismo, Tekken, etc). This erosion of consumer game sales was first seen after the shake-up in the Next-Gen console states, the surprise win to-date by Nintendo’s Wii was compounded by a slower than expected sales forecast for major brand releases in 2007. Though still phenomenally successful the selling power of Halo 3 was slower than expected, and seemed to chart a decline in a maturing market to buy as many new releases as with previous new consoles. With a closing window of opportunity for game publishers – looking to release a handful of ‘Big’ releases, rather than lots of wider exposure titles – the possibility that this restricted window of profitability could be affected by a game from the amusement market sent shockwaves through the detailed planning of a number of large publishers. To see the crippled circumstances that Atari Games and Midway have found themselves in recently underlining the difficulties of a changing sector. Some financial investors in major publishers are looking to secure their investments – forcing publishers to look at new markets – such as Casual Gaming. It was this topic that shaped this years’ GDC – but the opportunity of investment in amusement content was brought into sharp relief with the appearance of arcade cabinets running ‘Street Fighter IV’ in the Capcom suite, and the ground swell of popularity it generated. Capcom USA (that controls the franchise) unique arcade presentation to trade made a point of avoiding questions about the conversion of the game onto a home system, and focused on the interest in the game in an amusement package. Those console media and publishers that had done their most to deride and debunk the opportunity of casual gaming from an amusement perspective were left badly wrong footed by the GDC appearance. Some consumer game annalists speculated that if Capcom could find an influential distributor for the arcade game in America; able to feed emerging wide scale player interest to play the game in the arcades – populating cinemas, family entertainment centres, bowling allies and new Out-of-Home entertainment centres with machines. The impact in August’08 of the game could relive the success in amusement last seen with games such as Space Invaders, Asteroids, Sega Rally, Time Crisis or Dance Dance Revolution! 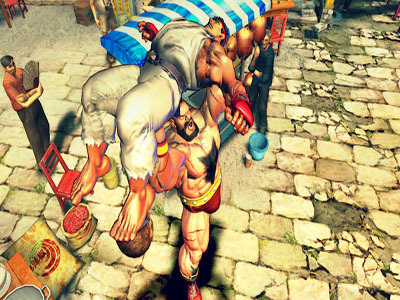 A fundamental element of the concern about the longevity of a rush to install SFIV is that this particular game is not just a common amusement release, but is dependent on its NESYS connected infrastructure with live-online support and IC Smart card capability. Emulating the underground success of the Golden Tee series in the bar and club trade; Street Fighter could totally re-write the perception of amusement as a revenue generator. This news rocking the very foundations of the consumer game trade – literally appearing in their back yard at GDC (and expected at E3). This shock appearance at GDC comes after the public forums and sites covered amusement in a level of detail unheard of from the conventional consumer games media – again wrong footing those that hoped to shape consumer gamer tastes – interest in amusement topics have even seen a number of prominent consumer game conferences this year adding a sessions discussing the impact of out-of-home entertainment as a serious revenue stream in this rejuvenated sector. Finally, as has been seen by the Vivendi – Activision, Take Two – Electronic Arts and other high-level merger negotiations; consolidation is hoped to maximise a shrinking profit window for lots of console titles. If this is impeded by outside forces, (cinema, gadget subscription…amusement!!) then real problems will be felt throughout a volatile development sector. The use of magazines, which these publishers control through their allocation of advertising revenue, to try and shape buyers preferences, be that slating new movie releases, over hyping and manipulating console game reviews – or direct attempts to ignore emerging markets, are all to be expected in this fight for survival. Author: Kevin Williams, KWP Limited – extensive writer and speaker on the Out-of-Home interactive entertainment market – a consultant in the field – as well as owner of the free leading industry e-News service, The Stinger Report. https://arcadeheroes.com/2008/02/26/battle-lines-arcade-street-fighter-iv-rocks-gdc/, and I would like to raise an issue that is of concern to Selling Power magazine, which is the use of our trademark. The word “Selling Power” is sometimes erroneously used as a synonym for sales effectiveness. For example, your article states: “Though still phenomenally successful the selling power of Halo 3 was slower than expected…” We do not condone such uses of our trademark. As a practical matter, when you describe sales effectiveness, there are a wide range of terms available such as: sales excellence, sales savvy, sales mastery, sales acumen, sales efficiency, and many more. The reason for this letter is to educate writers like yourself that we want to protect our trademark, since we don’t want to risk Selling Power being declared by the courts a generic word. Therefore we ask you not to use Selling Power as a phrase since it is our legal trademark. We would like to receive a written acknowledgement of this letter stating that you will in the future identify Selling Power as a trademark if you should write about our magazine, and not use Selling Power as a phrase. If we do not hear from you, we will need to take further action.